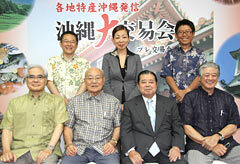 On May 21, at ANA Crowne Plaza Okinawa Harborview in Naha, Kunio Oroku (second from the right in the first row) with the people who established the executive committee of the Okinawa Trade Conference. To mark its 25th anniversary, the Okinawa Social Committee, which is made up of business leaders from Okinawa and the main islands of Japan, will hold the Okinawa Trade Conference in November 2014. They will also hold a pre-trade conference this November. On May 21, at the ANA Crowne Plaza Okinawa Harborview in Naha, the executive committee had its first meeting ahead of these conferences. They discussed the significance and prospects of holding conferences oriented towards the fast-growing Asian markets. The director of the executive committee is Kunio Oroku, who is the chief adviser of the Ryukyu Broadcasting Corporation and the secretary-general of the committee for Okinawa. On November 14 and 15, the committee will hold the pre-trade conference at the Okinawa Convention Center in Ginowan. They aim to call upon on 30 to 50 companies from Okinawa for the individual business talks on food products and another 60 to 70 from other prefectures including Hokkaido, Kyoto and Shizuoka. On the buyer’s side, they aim to call upon 60 to 70 companies mainly from South Korea, China and Thailand, Taiwan. The international airfreight project that uses Naha Airport as hub connects these countries and regions with Okinawa. They also aim to attract between 30 and 50 companies from other parts of the main islands of Japan.